Ceramic Cookie Jars Blue Ceramic Snow Fox Cookie/Treat Jar 5 X 7.5 X 5 Inches Blue by Zeckos at Animal Backgrounds. MPN: D-30903. Hurry! Limited time offer. Offer valid only while supplies last. The fox may be a sly animal, but when you reach in and find the bottom of this cookie jar, you know it isn't the fox who's stolen all of the treats! The fox may be a sly animal, but when you reach in and find the bottom of this cookie jar, you know it isn't the fox who's stolen all of the treats! 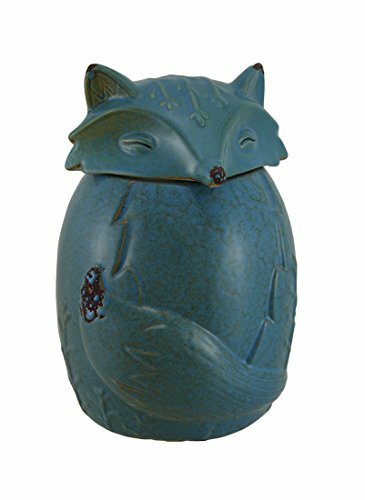 This adorable fox shaped cookie or treat jar is a great addition to any kitchen featuring a mottled blue finish to give it an aged look and a rubber seal to help keep the contents fresh longer. This 7.5 inch tall, 5 inch diameter (19x13 cm) ceramic fox jar is great as a gift for fox lovers and cookie jar collectors sure to be adored! NOTE: this item is being sold as 'Scratch and Dent' at a reduced price DUE TO SMALL WHITE SPOT ON BODY OF COOKIE JAR (DAMAGE MAY VARY PER PRODUCT AVAILABLE), and/or other minor defects. Please see available image(s) for an example. `Scratch and Dent` items are sold `as is` and all sales are final.